Mario and friends take to the courts. Play in singles or double matches and earn Coins with which to buy Gear. Play exhibition matches or tournaments, or take the game online to play against friends. As well as up to 24 playable characters, you can also select a customizable Mii whose skills are determined by the Gear they have equipped. 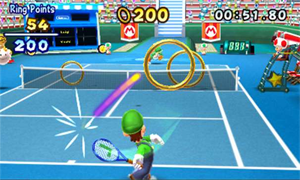 You can unlock additional characters and outfits by completing objectives and taking part in special tennis minigames, or by scanning special QR codes.